'Tis said of that ancient brooding forest that even before the world grew accustomed to the light of day, her stems were grown high and her leaves already dark and contemplative. If ever those ancient trees have pondered, however, then it was in silent expectation, brooding on a bent that only they and perhaps a few others knew, for it has never been theirs to speak with vocal tongue. Mayhap they ponder simple things, or maybe they wonder on the many creatures which have come to crawl the earth since those days before days. For all manner of beasts and monsters have come from the outlands to slip into obscurity underneath the shadowy vale of the Darkenfold. 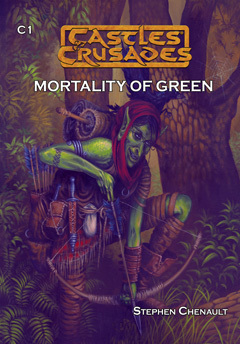 Mortality of Green includes an area map of the Darkenfold forest, information on the villages of Ends Meet and Greenbriar, hand outs for the players, and new monsters for the Referee. The module is designed for and easily accommodates any campaign setting, including the Winter Dark Campaign Setting. It is especially good for a single nights play.